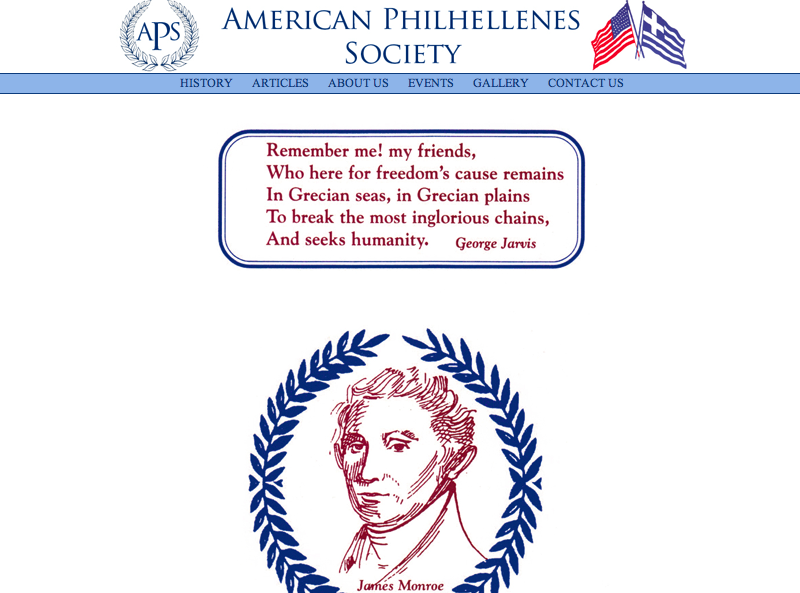 "The American Philhellenes Society was established to identify the Americans who, under the leadership of President James Monroe, supported and/or fought for the independence of Greece during the years 1810-1840 and to recognize and make known their contributions to the cause of freedom. We believe that it is time for us, as Greeks, Americans and American-Greeks to research these lives of these brave Philhellenes and to identify their descendants and honor them for their ancestor’s contributions. We have already identified some of the descendants of George Jarvis, Samuel Gridley Howe, and Jonathan P. Miller, and continue our efforts in this area. We believe that our ultimate findings will benefit both our countries and strengthen ties between them. In this effort, we ask your assistance. We need people with the time and the knowledge to research these and the many other American Philhellenes, and trace their families. Please contact us to help in this effort."